What Is a Gearing Ratio? What Does Gearing Ratio Mean, and How Is It Calculated? A gearing ratio is a type of financial ratio that compares company debt relative to different financial metrics, such as total equity. Investors sometimes use these types of ratios to assess how well a company can survive an economic downturn. Gearing represents a company's leverage, meaning how much of the business funding comes from creditors (debt holders) versus company owners (stockholders). A company's financial leverage represents its use of borrowed money to increase sales volume, thereby increasing profit. A business owner, for instance, may increase financial leverage with a bank loan that allows him to buy more production machinery. Financial risk represents the additional risk of default when a company expands its use of financial leverage. Although financial leverage and financial risk are not the same, they are interrelated. 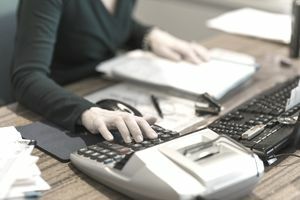 Measuring the degree to which a company uses financial leverage, or growing its business with borrowed funds, provides an easily calculated way of assessing the company's financial risk. Commonly used gearing ratios include the debt-to-equity ratio (total debt / total equity), times interest earned (earnings before interest and taxes (EBIT) / total interest), the debt ratio (total debt / total assets), and the equity ratio (equity / assets). Most of the inputs to the ratios come from the balance sheet, although EBIT is found on a company's profit and loss statement. To calculate the ratios, simply plug the information from a company's financial statement into the ratio equation. Take care to use numbers from the period in which you're interested; since balance sheet data represents a "snapshot" in time, use the same point in time when calculating and comparing ratios. For example, when calculating the debt-to-equity ratio for three years of financial history, an analyst would choose the same point in time, such as the year-end balance sheet, to gather data for the ratio calculation and year-to-year comparison, or quarter-end data to compare activity over four points within the same year. The results of gearing ratio analysis can add value to companies' financial planning when compared over time. As a one-time calculation, gearing ratios may not provide any real meaning. Although a single ratio result gives some information regarding the company’s financial structure, it has much more meaning when benchmarked against the same ratio from a different time period, a similar competitor, or the company's industry average. Interpreting the results of gearing ratio calculations offers management, analysts, and investors useful insights on a given company. For example, private equity companies often use borrowed funds to finance a large portion of each of their corporate acquisitions. Part of the money to buy (or take over) another company comes from the private equity firm itself. The remainder of the funds typically come from debt that the private equity firm secures in the name of the target company - against the target company's assets -, which then shows on the target company's balance sheet. This activity causes certain gearing ratios to rise as a result and reflects the additional risk of a new highly leveraged company. Although high gearing ratio results indicate high financial leverage, they don't always mean that a company is in financial distress. While firms with higher gearing ratios do have more risk, regulated entities, such as utility companies, commonly operate with higher debt levels. Monopolistic companies often also have higher ratio results because their financial risk is mitigated by their strong industry position. Additionally, capital-intensive industries (e.g., manufacturing) typically finance expensive equipment with debt, which leads to higher gearing ratios.